For those who have never been, Boulder may conjure up images of University of Colorado students strapping on skis to get through the snow to class, but the city offers many attractions beyond the winter months. Springtime in Boulder can still mean snow (March is the snowiest month in Colorado), but it typically melts off quickly and there are enough warm days for visitors to sip a Saison on a patio while tulips emerge from planters nearby. As you drive from Denver to Boulder on Highway 36, a set of sharp slanted rock outcrops on the Rocky Mountains come into sharper view—the Flatirons. The sandstone formations offer a striking backdrop during a visit to Boulder. The city sits at an elevation of 5,430 feet and offers a gateway to the mountains for visitors and its approximately 100,000 occupants alike. Boulderites—one-third of which are between the ages of 18 and 24—are known for their enthusiasm for the outdoors and a healthy lifestyle, and the city has good options for foodies and beer enthusiasts. The bike and pedestrian-friendly nature of the city also makes it easy for travelers to navigate. 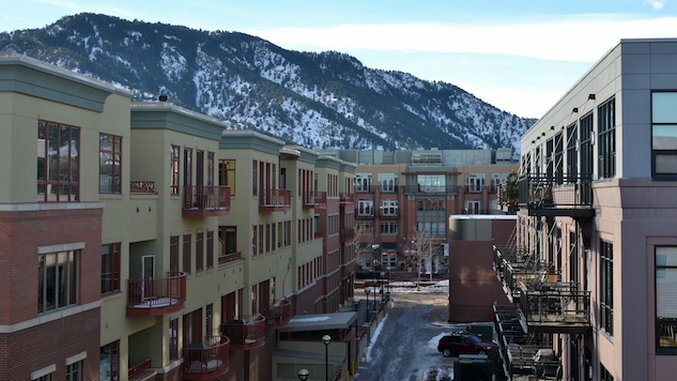 Begin your visit in Boulder’s downtown area, which is centered around Pearl Street. Head to Snooze, a popular breakfast spot with retro hip décor that got its start in Denver. Sit in one of their circular booths or on the patio, and try a sweet offering like the pineapple upside down pancakes, or a savory option like the Bella! Bella! Benny—an Italian twist on a benedict with prosciutto and arugula on toasted ciabatta bread. The earlier you arrive the better, as the wait can be long (but worth it). If you are in more of a coffee and croissant mood, head to The Cup Espresso Café nearby instead, and start your day with a hot latte poured with an artful steamed milk design or a cold nitro coffee served on draft. The cafe has a relaxed atmosphere with brick walls and chalkboard menus mounted on the walls, and during warm weather, their side doors are rolled up to open up the space. After breakfast, walk west (toward the mountains) and then take a left on 13th street and head toward the Boulder Creek path. You’ll pass by the Dushanbe Teahouse, a gift from Boulder’s sister city in Tajikistan. The building—featuring colorful ceramic floral patterns on the exterior (pictured above) and a hand-carved and painted ceiling on the interior—was made in Tajikistan and then shipped in pieces and reassembled in Boulder. Next to that is the Boulder Museum of Contemporary Art, which features rotating exhibitions. The museum is scheduled to reopen after a renovation on April 1 with an exhibit by sculptor and installation artist Martha Russo. Continue walking to the Boulder Creek path—a stretch of over five miles that runs through the city. In warm weather, you will see people tubing and wading in the water. Walk along the path or rent a red cruiser from Boulder’s B-cycle bike share program to explore more of it. When you are ready for lunch, make your way back to the Pearl Street. Brasserie Ten Ten serves French food in an unpretentious atmosphere with mosaic tiled floors, big windows, and exposed brick walls. Order a cup of soupe à l’oignon and a salad, or the steak frites—a sliced hangar steak served with fries and an arugula salad. After lunch spend some time exploring the Pearl Street Mall. The four-block pedestrian section was created almost 40 years ago and is a popular spot for a variety of street performers that can range from a string quartet of buskers to a performer juggling fire sticks. In the pedestrian mall, check out Boulder Book Store, a three-story independent bookstore with a large collection of books and small gift items. The Beat poet Allen Ginsberg did readings here (he lived in Boulder and taught at Naropa University). Also stop by Alpine Modern a shop whose mission, according to their website, is to “… elevate the modern design and lifestyles of mountain communities around the world.” The Boulder flagship store, located in the stark modern space just off Pearl Street, sells items from local and global artists including blankets, small wooden animal sculptures, and wall art. Walk east of the pedestrian mall (away from the mountains) to another collection of shops and restaurants. Common Era offers trendy women’s clothing and accessories at reasonable prices. Bliss sells stationery and small gift items like candles, kitchen and baby items. At the small European-style grocer Cured you can buy local cheeses, gourmet oils and jams, and oversized pretzels. For dinner, head to the buzzing contemporary restaurant Oak at Fourteenth on Pearl Street. Respected owner and chef Steven Redzikowski creates local and seasonal food focused on an oak-fired oven and grill. Try a warm bowl of shrimp and grits served in a slightly spicy Tabasco sofrito sauce for a twist on the traditional dish. You can also choose a cocktail from their menu that helpfully divides your choices between no, low, or high alcohol content so you can pace yourself accordingly. After dinner, walk to the Bohemian Biergarten and take a seat at one of their communal wooden tables in the beer hall-like surroundings. Try one of the rotating drafts identified by handwritten chalk signs at the bar. Options could include a seasonal beer from Denver’s German-style brewer Prost, or a Warsteiner Dunkel or Oktoberfest.